Villa Azul Celeste is located directly above the sea, on the Bay of Banderas, and offers incredible ocean vistas and a personal staff to make your stay carefree. The courtyard entry leads to an exquisitely furnished spacious villa with 4,000 square feet of interior space and additional 2,000 square feet of terraces, gardens, and a heated infinity pool. Tucked into the jungle of the quiet gated community of Sierra del Mar sits Jungle Views, a contemporary home filled with high quality furnishings and natural light. Located hillside in Alta Vista, just above the popular Zona Romantica & Los Muertos Beach, Villa Lucia has breathtaking ocean views of the Bay & the town. Set in a lush, jungle mountainside eco-refuge surrounded by fabulous trees and wildlife, this newly constructed villa offer breathtaking views of Puerto Vallarta and the Bay of Banderas from one of the highest points in Puerto Vallarta. Professionally designed and decorated, Ventanas al Mar or “Windows to the Sea” has incredible views from each and every corner. 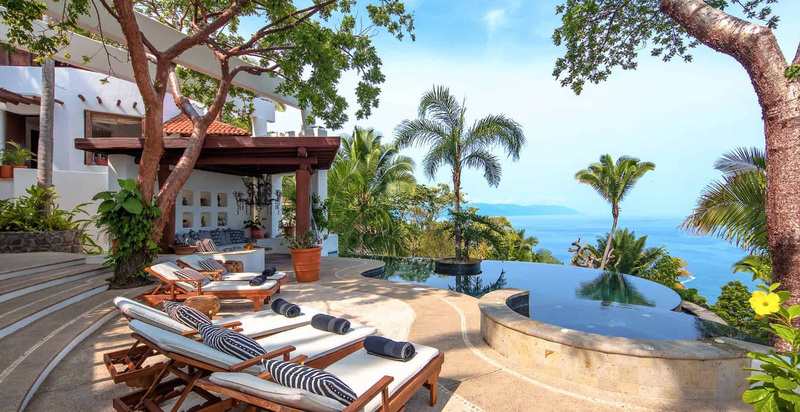 Casa San Sebastian, nestled majestically amidst cliffside boulders in a sheltered Pacific cove on Puerto Vallarta’s exclusive south shore, represents one of this coast’s most spectacular examples of contemporary “new palapa” architecture. Villa Amapas is an oasis of luxury, one of our best sellers in Puerto Vallarta. Superb location, impeccable staff, upscale architectural details, museum quality art, and large pool terrace make Villa Amapas South one of the best villas we can recommend for groups needing 4 bedrooms or more. This place makes you forget everything. Discreetly located on an island in one of the most beautiful and immaculate marinas on the Pacific Ocean, the exquisite Hacienda Isla Capitan is a gorgeous villa with easy access to the most pristine beaches of the Bahía de Banderas. Casa Castelli on Pacific Mexico’s Mismaloya coast is a living, breathing exhibition of art, nature and architecture. The flowing organic lines, arcs and curves that are emblematic of internationally award winning architect Alberto Alvarez’s style of design are complemented beautifully by the materials he chose to give this beautiful home in Mexico a romantic touch reminiscent of the regal villas of Tuscany..
Villa Vista de Aves is a private 5 bedroom villa located just a few steps down to one of the best white sandy beaches of Conchas Chinas & approx 2 miles from all the fun of downtown Puerto Vallarta. A spectacular private villa with mesmerizing ocean views across the infinity pool, located hillside in Conchas Chinas a short 5 minute drive to the Bohemian charm & energy of the Romantic Zone & Los Muertos Beach. Casa Dos Cisnes is a luxury five bedroom, five and two 1/2 bath Mexican colonial-style home located in the upper Conchas Chinas area. Built on four levels around a central courtyard, the house has approximately 10,000 square feet of living area with spectacular views overlooking the Bay of Banderas, all oriented towards Los Arcos and the Miami-looking north shore is not visible and does not destroy the view. 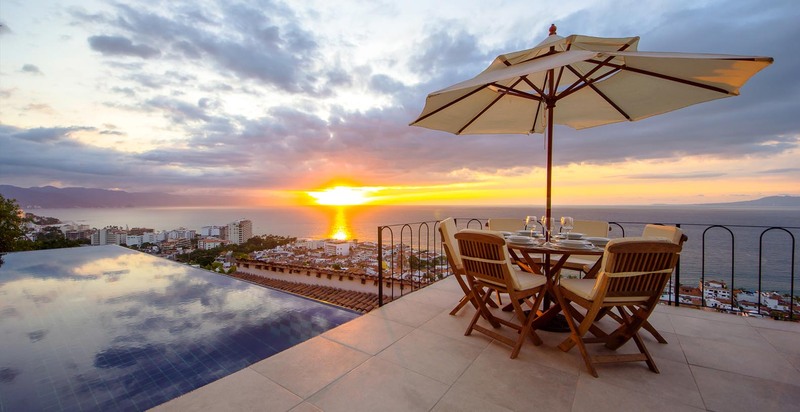 Brand new, luxurious Mexican style house located in Puerto Vallarta , Mexico . 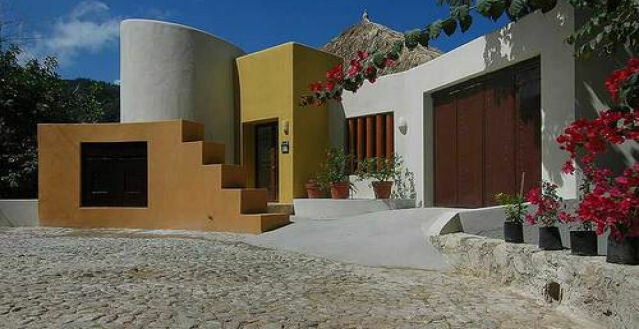 Situated directly on the waterfront, the house features stunning views of Los Arcos in the Bay of Banderas . Ocean breezes flow through the open architecture of the living area. Traditional Mexican and imported furnishings tastefully decorate the house. Welcome to Casa Carole Puerto Vallarta. It's a warm and friendly luxury 5-bedroom private vacation villa rental that we built right on the beach in Puerto Vallarta’s exclusive Conchas Chinas residential area. We’re just 5 minutes south of downtown Puerto Vallarta, Mexico, below the main coast road. Puerto Vallarta Luxury Villa II is an ocean view Villa located on the south side of Puerto Vallarta, between Mismaloya and Boca de Tomatlan. We are 25 minutes from downtown and 5 minutes from the nearest beaches . Enjoy this 5 bedroom house, where all bedrooms surround a beautiful pool and BBQ terrace. 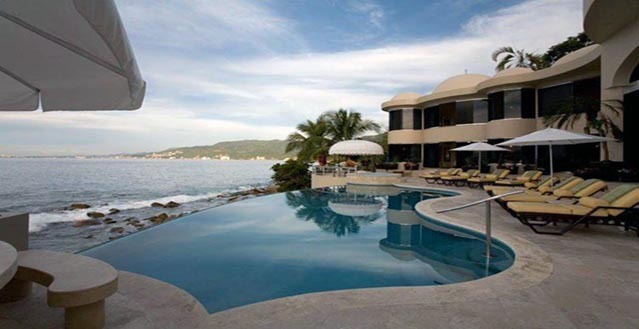 The villa holds up to 10 guests and has the most marvelous views to the Bay of Banderas. All of the bedrooms as well as the TV and Game room have air conditioners. Enter the gorgeous villa, Casa Salinas II, through an antique door from India into a haven of elegance and unique art. Ideal for active living and entertaining, the high ceiling living room flows to an expansive pool patio and an endless view of the bay. Beautifully furnished this 8,000 sq ft, open and airy luxury villa is located on a private sandy beach on the prestigious South Shore, just two miles south of town. Villa Ventura is a 6 Bedroom, 6 1/2 bathroom oceanfront villa located just south of Old Town near the Hyatt Hotel Ziva, formerly Dreams Resort. This villa is owned by Mrs. Fields (ie. World-Famous Mrs. Fields Cookies). Beto, the Chef, has even perfected the famous recipe. 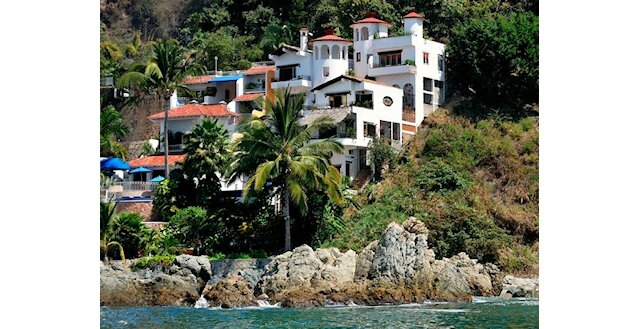 Only 5 minutes from downtown Puerto Vallarta, Casa Karma is a beautiful oceanfront villa in lower Conchas Chinas. The spacious rooms and large pool make it ideal for large groups. Casa Caleta is a very private, 6-suite Mediterranean Villa located in the prestigious neighborhood of lower Conchas Chinas, a short 5-minute drive South of Puerto Vallarta. Set within a privately gated enclave of 3 separate Villas, Casa Caleta is completely walled. Rancho Huracan is a dramatic 9.5 acre oceanfront villa estate designed to enchant all the senses and provide guests with a wondrous retreat home. Villa Ventana is a luxury six master bedroom, three level, media room, 10,000 square feet modern Mexican Villa completed in 2007 following two years of construction and meticulous finishing. The first of its kind here in Puerto Vallarta. Amapas del Mar has been architecturally designed to embrace the natural beauty and flow of the property that embraces it while leaving the least impact on the environment as possible. Casa Gran Dia is not only a place to vacation, it´s a small piece of heaven brought down to earth for you to enjoy in this paradise called Puerto Vallarta. This house is perfect for holidays, vacations, corporate retreats, family getaways, special celebrations etc. Welcome to the amazingly beautiful Villa Armonia! The offering nothing short of pure luxury, comfort, relaxation, elegance, privacy and secured safety while providing personal attention to the guest. This is truly a breathtaking Villa that offers quality, comfort and luxury accommodations with detail not found in Villa rentals in Bay of Banderas, Puerto Vallarta or Punta Mita. An elegant 10,500 sq. ft. private villa set in an walled estate located just a few blocks from popular Los Muertos Beach & a short walk to the Romantic Zone. Villa Tesoro del Mar is a stunning 7 bedroom, 11,000+ sq. ft home tucked perfectly into the hillside of Sierra del Mar, an opulent gated community with 24 hour security just 10 minutes south of downtown Puerto Vallarta. Introducing Sola Mia in Puerto Vallarta, the ultimate private getaway! This 3 acre oceanfront property at the south end of Las Animas beach, has an incredibly unique feature, it's own private sandy beach! Villa Santa Cruz is a 8 Bedroom villa with unforgetable ocean views of the south coast of Puerto Vallarta, located in upper Conchas Chinas. Luxurious Mexican-style home located in the exclusive Conchas Chinas district of Puerto Vallarta. Enter the antique wooden doors and be transported into a magical setting. The magnificent view of the Bay of Banderas catches your attention immediately. CASA TABACHIN- is located hillside with amazing vistas of the sparkling Pacific Ocean, the Sierra Madre Mountains and a city of excitement. Set in the Historic zone, the villa was a longtime favorite of the Hollywood jet set, hidden in a neighborhood of gourmet rooftop restaurants, with the sweet sounds of the Mariachis across the tiled rooftops. Impeccably managed and maintained by a staff of four and overseen by Juan the exceptionally helpful and knowledgeable English speaking manager all waiting to serve your every whim 6 days a week. They will service you with warm Mexican hospitality and you are assured of eating well with the chef’s gourmet cuisine. The maids will do guests personal laundry if requested. For those special celebrations Juan can arrange birthday cakes, flowers, Mariachis, manicures, pedicures, massages, etc. at the villa. In the beautiful gated community of Sierra del Mar, just past famous Garza Blanca Resort on the South Shore is Casa Sierra, the perfect place families, friends, wedding parties or groups with special events seeking a larger property to vacation at. Villa Mandarinas is a spectacular oceanfront walled Estate located on the South Shore just past Mismaloya beach. The estate includes the 8 Bedroom Main villa and the 2 Bedroom Casita, 2 infinity pools, & a man made tidal pool at the ocean level terrace. Villa Magnifico is a newly constructed luxury villa located hillside in Mismaloya with breathtaking ocean views. The spacious contemporary design villa has 10 bedrooms and a fabulous outdoor living area with heated infinity pool and outdoor dining & living and indoors a spectacular game room with pool table, poker, blackjack foozball and much more. This elegant ocean view Villa resort is an undeniable treasure only the truly fortunate will experience. Plan your next dream vacations, wedding, business convention, and all kind of special events at Villa Mia. Visiting Mexico has been a pastime of many families around the globe. It is a place where people can enjoy the beaches, the amazing scenery, and also take in some local shopping and sample some customary cuisine. The trips to Mexico can be both fun and exciting, no matter where you decide to journey on the Mexican Landscape. Oftentimes families travel for the enjoyment of the beachfront villas, found throughout Akumal, Riviera Maya, Cabo San Lucas, Puerto Vallarta, Punta Mita, Conchas Chinas, Cozumel, and Playa Del Carmen but that is just to name a few. Let me tell you a little about what you can expect from these areas. In Cabo San Lucas you’ll find amazing beachfront properties, from the Paraiso to the Cabo Beachfront Villa and the Luxury Cabo Villa. There are so many reasons to go to Cabo, some swear by the Surfing, while others love to visit local sites like Estero de San Jose (an Estuary), El Arco (Natural stone that looks like an Arc), El Faro de Cabo Falso (A great lighthouse). And others love to snorkel, enjoy fully catered resort villas, and just taken in the beaches. In Puerto Vallarta people love to Visit the Beaches to start, but if you’re looking to do more, go to Marina Vallarta where you’ll find plenty of great boutiques and some amazing shopping. You can also try South Shore with great private beaches and coves to discover, or just visit downtown where you can experience some amazing dining and entertainment while in town. No matter where you go, we have some amazing hillside and beachside villas that will accommodate small and larger groups. In Acapulco you’ll find an array of things do to aside from just the beaches. Some families enjoy seeing: La Quebrada Cliff Divers (where you’ll find divers all day long just lining up for the jump), Pie de la Cuesta (an amazing blue lagoon), Taxco (known to be one of the silver capitals of the world). Or have an adventure and take an Oceanriders Tour www.oceanriders.com.mx. Or just take a tour with one of these great companies http://toursinacapulco.com/. 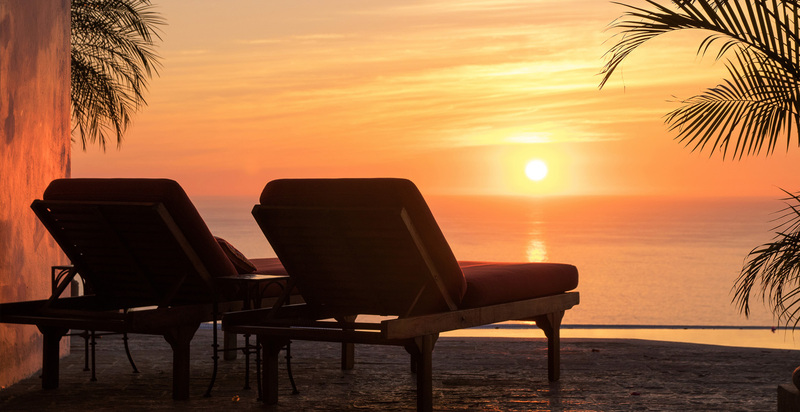 In Punta Mita, Nayarit Region, you’ll find the Luxury Villas and Golfers paradise. This is a location for those looking for more than the average trip. This location offers Beaches, fully catered Accommodations, as well as snorkeling, sailing, and amazing beach activities. For sailing, snorkeling, Horseback riding, and more go to http://puntamitaexpeditions.com/contact.htm. Punta Mita Golf is great at Jack Nicklaus http://www.nicklaus.com/design/puntamita/. Just a lovely location for travel with family and friends. Additionally Akumal Beaches, Cozumel, Riviera Maya, and so many other locations are just lovely to visit.